As you all know by now, my sweet, calm, rational husband has a bit of a passion. Passion/obsession, tomato/to-mah-to, but either way, come late August, I watch my dependable, intelligent, hard-working husband turn into a screaming banshee decked out in orange and purple. Clemson University is ranked the #1 football team in the entire country. Go ahead and take a minute to let that sink in. The last time Clemson won a National Title was in 1981 (I am only partially ashamed that I can rattle that off), so well before my darling husband made his way into this world. After many years of sitting in the stands for every single home game and praying for a win, we have finally found ourselves fans of one of the only undefeated teams in the nation. My husband is, if nothing else, an optimist when it comes to his Tigers. This year, as we discussed our holiday budget and how we would financially plan for gift-giving, my husband waited patiently until we figured out our strategies for the baby, families, and friends and then quietly suggested that he could "donate" the funds we allotted to spend on each other to a fund to get us to the National Championship Game. I knew he had already secretly/not so secretly reserved hotel rooms in both play-off destinations and the championship city, but it seems my guy has his eye on the prize. He wants nothing more than to go to a College Football National Championship Game and watch his Tigers take home the trophy. Who am I to squash his school spirit and Christmas wishes? So I agreed that I wouldn't purchase him any gifts this year and he would have nothing to open on Christmas morning. But, while I agreed, Santa made no such promises. And, with my Santa spirit in tow, off I went in search of the perfect Clemson Fan gift at the perfect (read: very reasonable) price point to surprise Justin with on Christmas morning. I am so excited to stash this little baby under the tree and for Justin to feel a teensy bit spoiled on Christmas morning. His new little bauble will look perfect while he's cheering on his Tigers (in the stadium!) at the National Championship game. 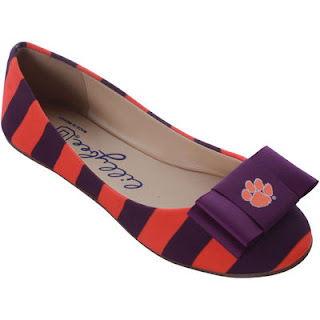 And, if I'm being honest, I have to admit that I took a peek at the Women's SportsFanShop and might just have to add this pair of flats to my "Game Day" wardrobe. For less than $75, I think two of us may see "surprise" Clemson themed gifts under the tree this year. If you have a crazy college (or pro!) sports fan in your life, you have to take a peek at the SportsFanShop, no matter how "small" your program is! JCPenney has an impressive amount of teams of all sizes covered from tee shirts to ballet flats, dog leashes and baby onesies. And no, I'm not going to admit how long I spent dawdling in the women's Fan Shop before remembering that I was shopping for my husband! What would you put under your tree from the JCPenney SportsFanShop? Leave a comment below and you will be entered for a chance to win a $100 JCPenney gift card! To check out great holiday gift ideas from brands like Nike, Levi's, Keurig, and more at JCPenney, just head over to their website and follow them on Facebook, Twitter, Pinterest, Instagram, Youtube, and Google+! Be sure to visit JCPenney’s brand page on BlogHer.com where you can read other bloggers’ posts! I'd love to get my husband a new Texas Tech polo! I like the Mens College Football Playoff Antigua Silver Leader Quarter-Zip Jacket. My husband is also a Tigers fan...LSU tigers that is. We've found some great stuff on the JCP fan shop and would definitely be will be buying more! I would buy Seattle Seahawks Hoodie and T-shirts and a hat for my son! He loves the Seattle Seahawks! I would put Mens Atlanta Braves Stitches Navy Blue Fastball Fleece Pullover Hoodie under my tree from the JCPenney SportsFanShop. I'd love to get some Michigan gear for my hubby (& myself!) Thank you! Our team isn't in the shop (Missouri Tigers) but our rivals the Kansas Jayhawks gear is and I have a friend that as much as it pains me, would love that gear!! We are big Tiger fans too! I've already bought my husband one of the Jack Mason wallets, but I'd love to get him the shaving kit or a belt! Fun giveaway! We are headed to Arizona if the Tigers make it! Go Tigers! I love this! I didn't know they had this shop. I'm a good sports fan (Purdue and Clemson) but live in Missouri so can't always find good stuff. I'm a fan of the watches too. Might put that Purdue watch on the list for my Dad's bday. As a Clemson Alumini, I would buy some Clemson hoodies and shirts for my husband and I.
I love those shoes except in maroon and white for Texas A&M! I would get my husband a Giants NFL Jersey, such as the Mens New York Giants Odell Beckham Jr Nike Royal Blue Game Jersey. I love those flats! I think I need either those Lillybee flats or some Panthers gear to show off here in Texas. It's a GOOD football season for this Carolina Panthers/Clemson Tigers fan! a patriot's jersey of course! I would put the Mens Pittsburgh Steelers Le'Veon Bell Nike Black Game Jersey under the tree. Um- they even have my dinky little Liberal Arts college on there. I would get a sweatshirt with my beloved MCLA Trailblazers. I would have to get some Vikings gear for my stepdad, and probably some Illini things for our family. My family are big Ohio State fans so that's awesome that JCP has this! I had no idea they had a sports fanshop! I would get the autographed Bo Jackson football! Love any of the Pitt Panthers ladies gear! Oh I would love to put the Men's Black Minnesota Wild Crusher Rubber Watch under the tree for my son! From the JCP SportsFanShop, I would get the Nike England N98 Full Zip Track Jacket for my hubby. He always support his English soccer league. :) Love JCP's wide selections. Cute flats! I would have to get some Kansas Jayhawk gear though! I would get my husband the Men's Stadium Athletic Scarlet Nebraska Cornhuskers Arch & Logo Full Zip Hoodie. I'd get the Men's '47 Black San Francisco Giants Cross Check Full-Zip Hoodie. I would get my son a Seahawks hoodie and beanie. I like to give the gift of scented soaps and lotions because I love getting those as a gift myself. I would put the Women's G-III 4Her Navy Dallas Cowboys Packable Polyfill Jacket for my sis. I would like to get an Ohio State sweatshirt for my nephew. My daughter is getting ready to move out of state so a new STL Cardinals hoodie would be a great gift! I would purchase an NFL comforter set for my son. I love the Women's Michigan Wolverines Button Up Boots. I like the Women's Navy Seattle Seahawks Holey Hooded T-Shirt & Tank Top Set. I would get a Patriot's jersey for my husband. I'd like to get a Green Bay Packers Antigua Women's Discover Full Zip Jacket for my daughter. Everybody needs more Penguins gear! I would gift my grandson a New York Giants jersey. My dad would like the Dallas Cowboys Silver Basic Cuffless Knit Beanie! I don't have twitter or a blog. So this comment is my only entry. Thanks for the chance! For the sports fans in my life I'd give jerseys. I would get Men's Majestic Red Texas Rangers Official Cool Base Jersey. My boys are huge Detroit Tigers fans so I would buy them each an Ian Kinsler Batting Practice Jersey from the JCPenney Sports Fan Shop. I posted a tweet: https://twitter.com/FireRunner2379/status/682371549568053248. I would put a Women's Reebok Ash WNBA Fleece Pullover Sweatshirt. I would put an NFL Jersey under my tree from the JCPenney SportsFanShop for my father. any apparel with the UK Wildcats logo! big fans here!